Captain Jacques Rudolph and head coach Toby Radford say the small size of Glamorgan's squad is responsible for their Championship struggles in recent months. 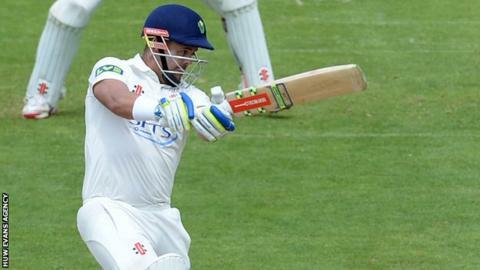 Glamorgan ended fourth in Division Two after a draw against Gloucestershire. "We were third for a long time and it's only in the last two or three games we've dropped off," said South African Rudolph. "But we have a very small squad and I think it's still a terrific effort." Glamorgan re-took fourth position from Northants on the last evening of the campaign, after picking up 12 points against Gloucestershire. "I think we've laid some good foundations," added Rudolph. "Hopefully we can have a few additions next year but if not, we have to stay mentally strong and try to play the way we have done this year." Chief executive Hugh Morris has spoken of the aim to sign seam bowlers and an additional batsman if the price is right. But the county may see Craig Meschede return to Somerset if they cannot agree an extension of his loan deal. Glamorgan won four and drew four in the first half of their four-day campaign, but lost four and drew four in the second half. The team had won three and lost six in each of the three previous seasons. Head coach Toby Radford summed up: "To use footballing parlance, it was a season of two halves. "Up till 12 July we were unbeaten and won four in a row to equal the record. "In the second half of the season we had a couple of losses and had to fight lots of rearguard actions as we started to get mentally and physically fatigued. "Overall, the top four was the target we set and we see that as a major improvement in Championship cricket. "I hope we can find one or two extra players, I'll be knocking on the door above me in the club to say that if we really want to push for it [promotion] we need a couple of extras." Meanwhile Rudolph is hoping for more home advantage in limited-overs cricket next season, after Glamorgan lost five out of seven T20 home games and saw their One-Day Cup campaign wrecked by a second points deduction, this time for a dangerous pitch. "Generally you would think that with home advantage and good pitches you should be able to do that [win more games] which we haven't really had. "Away from home we've played incredibly well [in T20]. "It will be interesting to see what Robin [acting head groundsman [Robin Saxton] and his team will come up with, hopefully we can see an improvement." The club will announce its annual awards in conjunction with the St Helen's Balconiers supporters group on Monday, 28 September.